Our Classic Vinaigrette adds a fantastic flavour to your salad. A perfect balance of Mellow Yellow Rapeseed Oil, white wine vinegar, herbs and spices, drizzle it over crisp lettuce leaves, delicate pea shoots, peppery radish and refreshing cucumber for a classic summer salad. Take inspiration from our simple recipes below and, most importantly, learn why you should never eat a salad naked! Why you should never eat a salad naked? It’s all to do with nutrition! Many of the vitamins and nutrients found in fresh salad are unlocked by consuming them with a healthy balance of fat (such as a salad dressing made with cold pressed rapeseed oil) drizzled on top. Read our blog post to learn all about this. Have you tried our Honey & Mustard Dressing? A match made in heaven; a dressing rich in Omega 3 from our cold pressed rapeseed oil and packed with the inherent health benefits from honey and cyder vinegar. Great with salads, it’s also the perfect partner for potatoes, or crunchy, steamed vegetables. Our Honey & Mustard Dressing is available from Waitrose, Sainsbury’s, Ocado and farm shops nationally, find your local stockist here. What about our Balsamic Dressing? A modern British twist on the classic Italian dressing, we have paired our Mellow Yellow Cold Pressed Rapeseed Oil with Aspall Apple Balsamic Vinegar to create a versatile and popular dressing. Packed with a punch of garlic and balanced with basil, it will make your humble tomato salad sing with flavour. Our Balsamic Dressing is available from Waitrose, Ocado and farm shops nationally, find your local stockist here. Our Protein Power Pot is packed with protein, makes a quick but filling lunch on the go. The delicious and nutritious combination of tuna, egg, watercress and quinoa works so well with the sharp and tangy flavour of Classic Vinaigrette. Assemble this in a Kilner jar for easy transportation and give it a good shake to mix before you eat. Find the full recipe here. This Puy Lentil Lunch Pot is quick to make and great as a healthy and substantial lunch, this little pot is bursting with delicious goodness to get you through the afternoon, pop it on your desk and dig in. With puy lentils, feta cheese, rocket, mint, red onion, cucumber, pomegranate and pumpkin seeds, this salad is bursting full of colour and flavour to give you a lunchtime boost. Find the full recipe here. 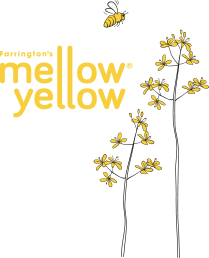 Our Mellow Yellow dressings were created by Eli Farrington in the farmhouse kitchen, using her trusty jam jar and superior taste buds. Using our Mellow Yellow Cold Pressed Rapeseed Oil, along with the finest quality British ingredients, Eli has created a range of award-winning dressings with no additives or preservatives. Each dressing is carefully crafted with a balanced flavour, ideal for a variety of uses from a dressing on a simple salad to a marinade for a sausage hot-pot. The environment has always been incredibly important to us, that’s why we grow our rapeseed to LEAF (Linking Environment and Farming) Marque standards. LEAF is a charity that works with farmers to promote environmentally responsible and sustainable farming, using methods such as wildflower meadow margins, beetle banks and sustainable crop rotations. Learn more about our LEAF credentials here. Stay up to date with our latest recipes, find out when we are on offer in a shop near you and learn more about our farm by signing up to our newsletter. Simply enter your details in the form below to stay involved!